In 754 AD Abu Jafar al Mansur became the second caliph of the Abbasid dynasty. In 762 he laid out the ground plan of his new capital, Medinet-es-Selam, “City of Salvation.” For 500 years this city, the round city of Baghdad, was the chief city in the Moslem world. The map that appears on the stamp is an adaptation of a reconstruction based on a detailed description of the city and its suburbs by Yakubi, and an account of the system of canals that flowed through the suburbs by Ibn Serapion for the period between 775 and 1125. The plan was made to illustrate Guy Le Strange’s Baghdad during the Abbasid Caliphate, Oxford, 1900. 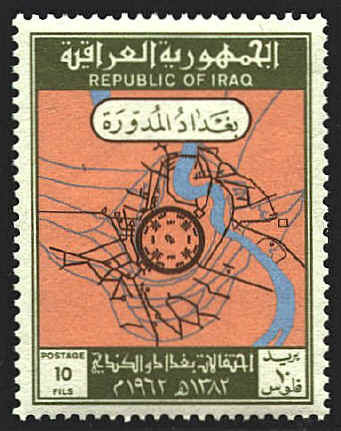 The stamp was issued in 1962, 1200 years after the city was founded.